"A Pizza The Action" is a business book wrapped in a personal memoir. In its well-organized pages you'll quickly discover more than a dozen rules revealing 54 vital lessons as told through a series of spell-binding real-life stories of a young man who becomes a young businessman as he works in his grandparents' pizza stand at the Erie County Fair. "In the mid-1970s through the early 1980s, life in the pizza stand at the Erie County Fair was nirvana. I thought I could work there forever. But life happens. Eventually, it was my turn to transition from full-time student to full-time worker. I thought I could do both. I couldn't. And I shouldn't. Life moves on. From one generation to the next. The greatest gift the older generation can give to the younger is to share the secrets to its success and cultivate the next generation so it can stand - and succeed - on its own. That was the final lesson - the lesson of giving, And I learned it this way..." - Chris Carosa, author, A Pizza The Action Scenes from an Italian Entreprenuer Even the simplest of life's activities can build the most enduring memories. More important, in subtle ways they can offer lessons that stand a lifetime. When fully absorbed, these lessons can yield powerful results. In his book One Up On Wall Street, Fidelity's superstar investor Peter Lynch explains how everyday investors can profit just by paying attention to the companies in their own backyard. Similarly, it is these same "backyard" (and sometime front yard) experiences of our youth that provide the lessons needed to reach the highest of heights in the business world. Much has been written of the proverbial lemonade stand and how it teaches budding entrepreneurs the meaning of business. 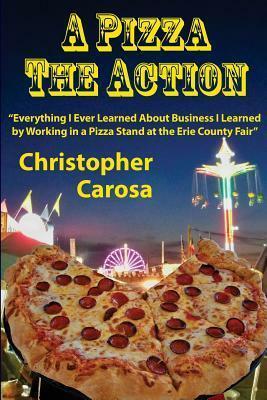 This book takes place in the real-life world of a small family-owned and operated pizza stand in one of America's most popular and prosperous annual fairs - the Erie County Fair - and follows through the events that led a young adult to learn invaluable lessons that, in the future, would help him become a successful entrepreneur. Chris Carosa takes a series of mundane, everyday events not unlike what many experienced growing up - if they grew up working in their grandparents' pizza stand at the Erie County Fair! What's amazing is he takes these vignettes of his life as a Carney and connects the dots to come up with 15 general rules - told through 54 specific lessons - he's followed in all his entrepreneurial ventures. Mr. Carosa tells these stories through the same conversational and, at times, self-effacing style his readers have become familiar with. Among the 54 Fascinating Lessons, You'll Discover: - The Four Fundamental Basics of a Winning Business - What Always Comes First (despite what you might think!) - The Only Color that Matters - Why the Odds are Never in Your Favor (and how to change that) - What You Must Do if You Really Want Something - The Two Secrets of Making Memorable Presentations - How Exactly the Peloponnesian War Ties Into a Pizza Stand at the Erie County Fair - The One Concept All Successful Businesses Must Embrace - The Six Rules of a Good Carney - The Relationship Between Good Marketing and Good Engineering - If You Loved the Peloponnesian War Reference, You'll Treasure the Thermopylae Metaphor - Why You Must Have a Plan C - And, Finally, Why You Must Always Think Outside the Pizza Box! Christopher Carosa as the oft-quoted President of the Bullfinch Fund and its investment adviser Carosa Stanton Asset Management. A popular and entertaining nationally recognized speaker from coast to coast, he has appeared in, among other media outlets, The New York Times, Barron's, CNN and Fox Business News. Mr. Carosa was born in Buffalo. He is a well-known promoter of the Greater Western New York region and also recognized as the local author of the book 50 Hidden Gems of Greater Western New York, of which he's spoken about to many area service clubs and organizations. He's the first graduate from Gates-Chili High School to attend Yale University. Mr. Carosa has been a top rated AM disc jockey, at one time was declared one of Rochester's "Most Eligible Bachelors," has climbed to the top of two volcanoes (including Mt. Vesuvius), once earned a national prize for his academic research, has seen a stage play he's written (The Macaroni Kid) performed to sold out audiences, and generally has had a pretty good life. Along the way Mr. Carosa has also been a successful serial, some say parallel, entrepreneur. He's created a market research company, a weekly suburban newspaper, a trust company, a mutual fund, and a national media company. Although he has an MBA from the University of Rochester's Simon School, Mr. Carosa says he did so only to tell people he didn't need an MBA to be successful. In fact, he claims everything he ever learned about business he learned by working in his grandparents' pizza stand at the Erie County Fair. Mr. Carosa has also written Hey! What's My Number?, 401 Fiduciary Solutions; A Life Full of Wonder; and, Due Diligence. In addition to other publications, he has written more than 500 articles for FiduciaryNews.com. If you'd like to read more by Mr. Carosa, browse his author's site, ChrisCarosa.com; a site to a book he's working on, LifetimeDreamGuide.com; a site devoted to his first love, AstronomyTop100.com, and a site where he, his son, and his daughter offer reviews to classic Hollywood movies, MightyMovieMoments.com. What he enjoys most, though, is sharing the spell-binding stories of Greater Western New York with family, friends, and fans of the region. Those willing to join him on his crusade to promote all things Greater Western New York are invited to visit GreaterWesternNewYork.com to learn more. Mr. Carosa lives in Mendon, NY with his wife, Betsy, three children, Cesidia, Catarina, and Peter, and their beagle, Wally.